Armor fans just can't seem to get enough 'stuff' to add to their favorite vehicles and it seems that German stuff is very popular. 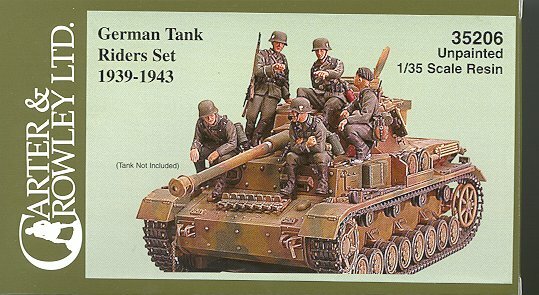 In order to let you build a nicely weighed down tank, Carter & Crowley have come up with a set of 5 figures, all designed to ride on your favorite Wehrmacht tank. The five figures are all listed on the bag with a number, indicating that they are or were available separately. No need to hunt them up now as they are all here in one set. 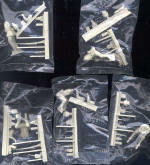 Each figure is very nicely detailed and comes with an array of bits and pieces to add on for that additional detail. I've scanned the figures still in their bags to keep from losing pieces. Basically, there are two figures fully sitting, one half sitting with a leg stretched out, one squatting and another fully standing. There are no painting instructions: the box art should be sufficient for that. There was also a very thin piece of sheet brass in mine, but what it is for is beyond me. All the figures are for the time period from the beginning of the war until around 1943 when there were changes to the uniforms.